A shared preference implementation for secret data providing confidentiality, integrity and authenticity . Per default uses AES-GCM, BCrypt and HKDF as cryptographic primitives. In this mode, if on a KitKat device the backwards-compatible implementation is used, the default AES-GCM version otherwise. Upgrading to a newer OS version the content should still be decryptable, while newer content will then be encrypted with the AES-GCM version. AES + GCM block mode: To make sure that the data is not only kept confidential, but it's integrity also preserved, the authenticated encryption AES+GCM is used. GCM can be implemented efficiently and fast and is the usually alternative to encrypt then mac with AES+CBC and HMAC. The authentication tag is appended to the message and is 16 byte long in this implementation. A downside of GCM is the requirement to never reuse a IV with the same key, which is avoided in this lib. Every put operation creates a different cipher text: Every put operation generates new salts, iv so the the resulting cipher text will be unrecognizably different even with the same underlying data. This makes it harder to check if the data actually has changed. KDFs with Key Stretching features for user passwords: Add brute-force protection to possibly weak user provided passwords. Minimum SDK 19 (Android 4.4): A way to increase security is to cap older implementation. SDK 19 seems to be a good compromise where most of the older security hack fixes are not necessary anymore, but still targeting most devices. Use of JCA as Provider for cryptographic primitives: Various security frameworks exists in Java: BouncyCastle, Conscrypt, Facebook Conceal. The problem is that these libraries are usually huge and require manual updates to have all the latest security fixes. This library however depends on the default JCA provider (although the developer may choose a different one). This puts trust in the device and it's implementation, while expecting frequent security patches. Usually the default provider since KitKat is AndroidOpenSSL provider which is fast (probably hardware accelerated for e.g. AES) and heavily used by e.g. TLS implementation. 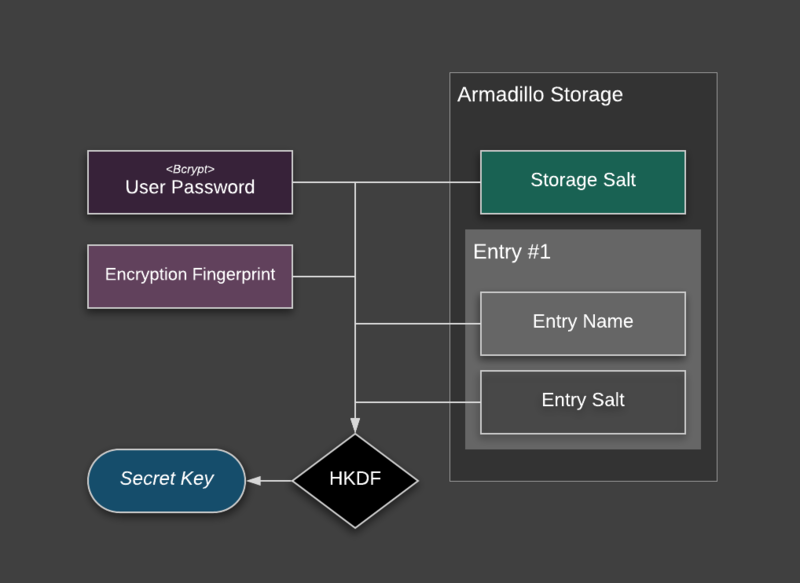 Android Keystore System is not used: In my humble opinion, the Android Keystore is the best possible way to secure data on an Android device. Unfortunately, due to the massive fragmentation in the ecosystem properly handling and using the Android Keystore System is not easy and has some major drawbacks. Due to working in a security relevant field I have a lot of experience with this technology, therefore the decision was made to not support it for this implementation i.e. to keep it simple. Use of data obfuscation: To disguise the actual data format and appear as a pseudo random byte array, obfuscation is used. This deliberately uses non standard ways to make it a bit harder to reverse engineer. A high entropy value not known to any system but the user is a good and strong base for a cryptographic key. Unfortunately user-based passwords are often weak (low-entropy). To mitigate that fact and help preventing easy brute-forcing key derivation functions with key stretching properties are used. These functions calculate pseudo-random data from it's source material which requires mandatory work. It is possible to provide any KDF implementation to the storage with providing a custom KeyStretchingFunction implementation. Note, if you use key stretching put/get operations will get very slow (depeding on the work factor of course), so consider accessing the store in a background thread. This store bases part of it's security on so called fingerprinting. That basically means, during runtime entropy from e.g. the device, system or other parts are used to create a cryptographic key with which the data is encrypted. It basically is encryption with a semi-secret key. The concatenated key material will be derived and stretched to the desired length with HKDF derivation function. The key is hashed with HKDF (which uses Hmac with Sha512 internally) expanded to a 20 byte hash which will be encoded with base16 (hex). The key generation is salted by the encryption fingerprint, so different shared preferences will generate different hashes for the same keys. The diagram below illustrates the used data format. To disguise the format a little bit it will be obfuscated by a simple xor cipher.